"... I have now been using this protein for about 7 weeks and I am impressed. I've used myofusion and 100% whey in the past and these are better for the simple fact that I can actually see results. I will note that the white chocolate is the best protein flavor on the market as far as I am concerned. Will continue to use and recommend it to others." Finally a True Protein Powder Designed for Athletes by an Athletes.. Introducing Promasil! 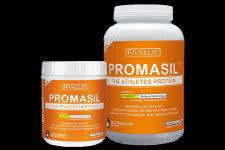 Rivalus sports supplements presents one of the purest proteins on the planet, Promasil whey powder! A perfectly advanced combination of 7 protein blends designed to help feed and refuel your muscles like never before! Unlike the rest of the protein shakes out there today, Promasil is the one that is specifically created for the demands of a true athlete. This anabolic blend is fused with beta-alanine to further improve the benefits you will experience. Nano-partitioned as well as hyper fractionated profiles help you get the most out of each amino acid. If you wish to take your recovery and new growth to the levels you think you deserve, then add Promasil to your daily supplementation mix and reap the results! Chocolate, White Chocolate, Strawberry and Vanilla Flavors!